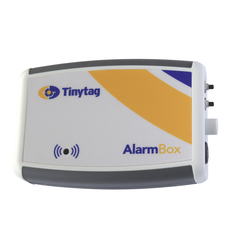 The alarm box works with Plus 2 and View 2 loggers, providing an alarm when triggered. It can be programmed to sound after a preset delay to enable work to be carried out in monitored areas. A pair of volt-free contacts within the unit allows an external device, such as SMS dialler, to be connected.